“Lenovo is truly committed to further enhancing the consumers’ experience by launching a device with great multitasking capabilities and unrivalled features at an affordable price. The Lenovo A7000 Plus is definitely a disruptive offering with its future-proof features, superior multimedia specs and extraordinary performance,” said Dino Romano, Country Lead, Lenovo Smartphones, Philippines. With the Lenovo A7000 Plus exclusively retailing at Lazada , everyone can now enjoy the power-packed features of the Lenovo A7000 Plus with the effortless and risk-free shopping experience from the Philippines’ One-Stop Shopping and Selling Destination – Lazada. Bigger, brighter, and more advanced features characterize the Lenovo A7000 Plus, which features a 1920 x 1080 resolution full HD display, allowing users to see dazzling visuals and stunning graphics in their truest colors and finest details from all angles. It offers a 360-degree sound experience thanks to the latest Dolby® Atmos™ technology, giving the users a full and extensive multimedia experience. The A7000 Plus captures perfect images with an impressive 13 megapixel auto-focus main camera with Dual LED Flash, and a 5 megapixel front camera. Equipped with a 16GB storage expandable to 32GB via microSD slot, it gives users liberty to store as many photos, videos, games, and files as they want, when they want it. Powered by a 1.7 GHz Octa-core processor coupled with 2GB RAM, this powerhouse offers seamless 4G TDD-LTE connectivity and dual SIM slots allowing users to multitask efficiently. It runs on Android 5.0 Lollipop that promises a fast and smooth user interface. 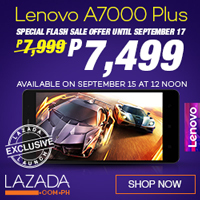 Lenovo once again partnered with Lazada, the Philiphttp://ho.lazada.com.ph/SHDBfxpines’ One Stop Shopping and Selling Destination, to introduce the Lenovo A7000 Plus to the market at a very affordable price. “Lazada is thrilled to launch the Lenovo A7000 Plus in the Philippines, building on the partnership we started with the highly successful Lenovo A7000. We bring our market leadership and our ability to reach millions of consumers across the Philippines, to help Lenovo catapult this amazing product to top seller status in the market,” said Mr. Inanc Balci, Chief Executive Officer of Lazada Philippines. The Lenovo A7000 Plus will be made available through Lazada starting September 15 at Php7,999. The Lenovo A7000 Plus will be bundled with a free screen protector (worth Php299) and a free back cover (worth Php599). Moreover, There will be a flash sale at Lazada that will further slash the price to 7,499. Hurry and click the link below.